As shown in this video, one can easily make a screen recoding of an iOS device (running iOS 11 or later) using the built-in mechanism. 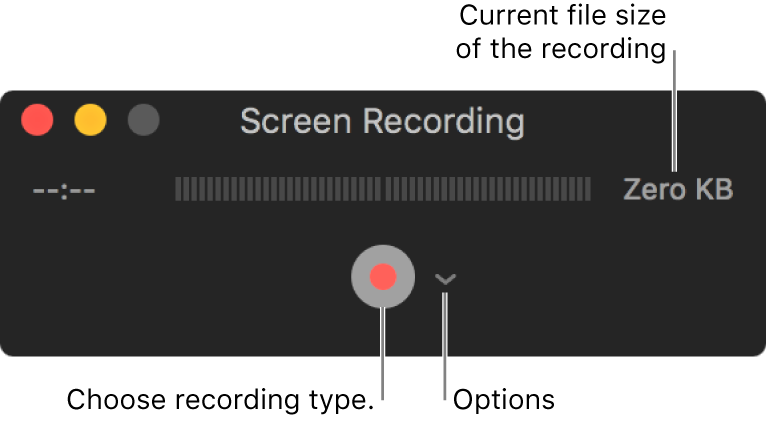 Is there a similar built-in facility available in macOS to record Mac screen? You can use the built in QuickTime Player.app in macOS to record screen. Follow the instructions in the Apple support article, Record your screen. Open QuickTime Player app by going to Launchpad → Other or by searching for QuickTime in Spotlight. Once the app is open, in the Menu bar go to File → New Screen Recording or alternatively use the keyboard shortcut, Control + Command + n.
In the presented window as shown, click on the record button, then choose the recording type. When you’re finished recording, click Stop in the menu bar. Choose File → Save, then enter a name for the recording. The recording is saved as an H.264 format QuickTime movie with an AAC audio track (if audio was selected). Not the answer you're looking for? Browse other questions tagged macos screen-capture recording screen-recording . What's the easiest way to do a screen recording and get a small file? How to record/stream iPhone 4 screen with iOS 7? Is there a programmatic way to identify built-in applications?